Celebrating the life of Hartford Curtiss Barnett Jr.
Be the first to share your favorite memory, photo or story of Hartford. This memorial page is dedicated for family, friends and future generations to celebrate the life of their loved one. 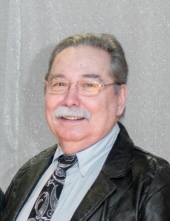 Obituary for Hartford Curtiss Barnett Jr.
A Taylorsville Resident, Mr. Hartford Curtiss Barnett Jr., age 68 passed away Tuesday, January 8, 2019 at his residence. He was born July 14, 1950 to the late Hartford Curtiss and Flora Jean Gibbs Barnett Sr. Hartford was a carpenter and an employee of Geogehagan Roofing, a member of Taylorsville Trinity Church and an Army Veteran. He is survived by 2 daughters, Reba Rae (Michael) Clark of Taylorsville and Leah Rae Barnett of Sacramento, Ca; son, Levi Barnett of Jeffersonville, Ind; and brother James Edward Barnett of Sandy Hook Va. ; 4 Grandchildren also survive. Cremation was chosen by the Family and a Memorial Service will be held at a later date. The Greenwell-Houghlin Funeral Home of Taylorsville is in charge of arrangements. To send flowers or a remembrance gift to the family of Hartford Curtiss Barnett Jr., please visit our Tribute Store. "Email Address" would like to share the life celebration of Hartford Curtiss Barnett Jr.. Click on the "link" to go to share a favorite memory or leave a condolence message for the family.